In a world projected to have 2 billion cars by 2035, could carsharing put us on a path toward lower motorization in quickly growing countries? In the Global North, carsharing has been shown to reduce the number of household vehicles and reduce overall greenhouse gas emissions. For example, studies conducted in Canada and the United States showed that each shared vehicle replaced 9 to 13 privately-owned vehicles from the road. However, we know very little about the business viability, market potential, or social and environmental impacts of carsharing in emerging economies. Despite global growth, only a small number of carsharing services are operating in developing countries. While carsharing could potentially lead to more driving, it could alternatively help these cities “leapfrog” car ownership to a future of sustainable shared mobility. Here are some of the reasons why. Like any transport mode, the impacts of carsharing hinge on local context. For example, in the right urban situation, carsharing could improve access to urban amenities and opportunities, reduce overall car use, reduce emissions, decrease cost of car ownership and slowdown the rate of personal motorization. However, many of these positive benefits require that a minimum level of transit and multi-modal options already exist. In the absence of an adequate transit system, carsharing could accelerate motorization and spur demand for permanent car ownership by reducing the barrier to driving, especially for non-car owning households. Troublingly, by stimulating interest in car ownership and use, carsharing could increase congestion, pollution, and traffic crashes. Individuals in the developing world—and specifically those participants from our research in Hangzhou, China and Bangalore, India—have strong aspirations for vehicle ownership, particularly in India. For many, personal vehicles are a status symbol. Another common reason that many people aspire to ownership is that they highly value personal mobility. Private vehicles are seen as a solution to dealing with long commutes, traveling with family comfortably, and “chaining” trips together. In sum, carsharing has the ability to replace car ownership, but it needs the right environment—adequate pedestrian and bike infrastructure and public transport—in order to do so. In both Hangzhou and Bangalore, people without an automobile showed a strong desire for car access, especially for non-work related trips like shopping and leisure. For example, in Hangzhou all non-car owners expected to buy a car in the future—and 50 percent had plans to purchase a car within the next two years. Despite this desire for car ownership, carsharing could replace a car purchase, or at least delay one. 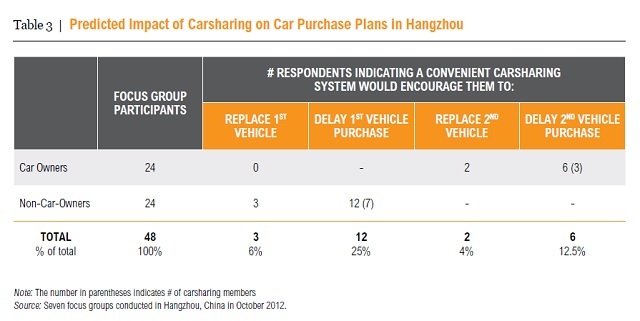 While many people consider the car a symbol of social status, about 50 percent of the people in Hangzhou indicated that a convenient carsharing service would likely encourage them to delay or replace their car purchase plan. In Bangalore, almost 30 percent of all focus group participants said they would consider delaying the purchase of their first car in favor of carsharing. Though car owners were highly reluctant to get rid of their vehicles, almost all car owners said that they might forego the purchase of a second or third vehicle, provided a good alternative travel mode was available with last mile connectivity. This data reveals a willingness to depart from car ownership. The key, however, is to market carsharing appropriately. It is possible that in the short-term, carsharing could increase car use, as non-car owners gain affordable access to a car. After all, participants in the focus groups expressed strong desires for increased auto mobility, which suggests that in Hangzhou and Bangalore, affordable access to carsharing could accelerate car use. However, car ownership and car usage are heavily intertwined, so reducing car ownership could mitigate usage—i.e. total number of vehicle-kilometers traveled (VKT)—and reduce air pollution, congestion, and other negative impacts. For this to happen, cities need to implement complementary policies discouraging the use of personally owned cars, establish efficient transit systems connecting the city and create highly walkable and bicycle-friendly neighborhoods. Carsharing therefore requires the right kind of policy environment to ensure a positive impact for sustainable mobility. Furthermore, carsharing can also be used to introduce fuel efficient and electric vehicles, potentially reducing the environmental impact of traditional car usage through innovative energy solutions. This is, however, highly dependent on how clean a country’s electric grid is—since electric cars do little for the environment if the electricity they use is produced from dirty energy sources. Ensuring a future of sustainable shared mobility will require further research on carsharing in these emerging markets. But it’s a possibility worth investigating.